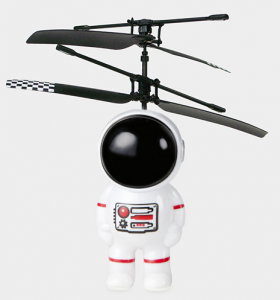 This fun toy combines your child’s love of helicopters, astronauts and remote controls! The spaceman hovers from room to room providing hours of indoor fun. Control his flight patterns with a 2 channel infrared remote controller. A powerful twin rotor propulsion allows for flying up to 50 feet high. Includes a rapid battery charging unit. Charger requires 8 AA batteries (not included). Remote controller requires 3 AG13 batteries (included). Recommended for ages 8 and up. This gets some serious height! Good park activity! I wish this had some reviews on mamastore. I think it’s something my oldest would love, but it says age 5 and up and I wonder how easy it really is to control.